Florida Panthers defenceman Dmitry Kulikov (7) and defenceman Mike Weaver (43) and forward Aleksander Barkov (16) and forward Sean Bergenheim (20) celebrate a goal during the second period as Toronto Maple Leafs defenseman Dion Phaneuf (3) skates to the bench at the Air Canada Centre. 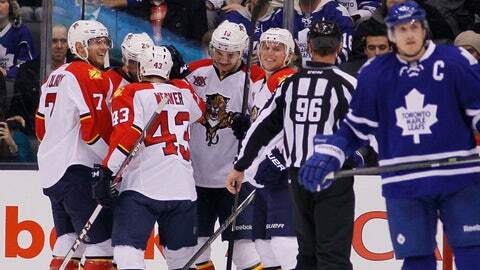 TORONTO (AP) — The Florida Panthers are starting to make steady progress in the Eastern Conference. Tomas Fleischmann, Sean Bergenheim and Brad Boyes scored for the Panthers in a 3-1 victory over the Toronto Maple Leafs on Tuesday. The Panthers won their fourth straight and sixth in their past seven games. With the victory, Florida moved within six points of Toronto in the Eastern Conference. Mason Raymond scored for Toronto, which lost for the fifth time in their past six games. The Maple Leafs, who played Monday night in Pittsburgh, did not want to use fatigue as an excuse. The Leafs committed turnovers that led to all three Panthers goals and were never really able to keep up. “I echo those remarks as something that we cannot be proud of our performance tonight,” coach Randy Carlyle said. Center Nazem Kadri was the first Leafs player to make a costly error. He lost the puck at the Panthers blue line. And seconds later, Fleischmann had a jump on Carl Gunnarsson and beat Reimer to make it 1-0 just 3:29 in. Sloppy play continued, but it didn’t hurt the Leafs again until a poor defensive-zone shift in the second. Defenseman Jake Gardiner put the puck right on Bergenheim’s stick, but Reimer made a stop to keep the threat at bay. When the Leafs couldn’t clear it, Bergenheim got it back in front and scored 5:54 into the second. Phaneuf’s turnover contributed to the Panthers’ third goal. Boyes poked the puck away from Phaneuf and scored seconds later on his own rebound thanks to some help from Bergenheim in front. The Leafs cut it to 3-1 not long after on their most opportunistic play of the game. Center Peter Holland, filling in amid injuries to Dave Bolland and Tyler Bozak, held onto the puck long enough to get some traffic in front, and Raymond tipped the puck past Clemmensen 3:43 into the third. Carlyle didn’t like the lack of second opportunities. “I classified our game as we tried to plan shinny against an NHL hockey club tonight,” he said. Clemmensen made 28 saves for the victory. The veteran goalie acknowledged, as did Horachek and other Panthers players, that the Leafs were tired. But it was incumbent on the visitors to take advantage of that. This was their third victory in the past two weeks against a team being featured on HBO’s “24/7” program. Florida beat the Detroit Red Wings on Dec. 7 and Dec. 10. The Leafs are looking to get things going in the right direction. NOTES: Center Trevor Smith broke a bone in his right hand when blocking a shot from the Panthers’ Shawn Matthias in the third period, Carlyle said. Smith has four goals and five assists in 24 games this season. … Last year’s Calder Trophy winner, Jonathan Huberdeau, missed his second straight game with a foot injury. Horachek said he could have played and is hopefully on target to be in the lineup Thursday when Florida visits the Ottawa Senators.